Air conditioning refers to the process of making some changes on the essential properties of air more specifically its humidity and temperature in order for all these to obtain more favorable conditions. It can also be defined as all kinds of technological ventilation, heating, disinfection and cooling that tend to modify the present air condition. It can also be defined as one of the major home appliance mechanisms and systems that are primarily designed to make some positive changes in the humidity and temperature of air within a specific area. It is mainly utilized in either cooling or heating an area based on the properties of air on a particular time. It should be noted that the cooling process is usually done by air conditioning units with the help of a simple and easy to understand refrigeration cycle. There are also instances when evaporation is used and this method is mainly designed for comfort cooling inside motor vehicles and buildings. It should also be noted that the major process that air conditioning units use in reducing the air temperature within a specific environment or a particular room is mainly based on simple scientific principles. It is also important for you to note that air conditioning systems is quite similar to a refrigerator. Note, however, that air conditioning is not installed with the exterior housing used by refrigerator in insulating its cold box. What is used in keeping hot air out and cold air in is your home’s walls. 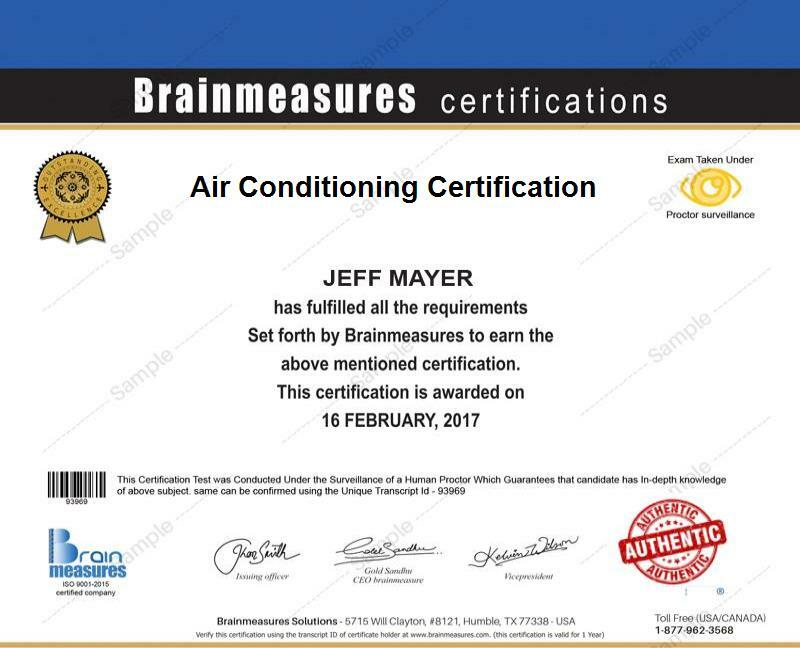 If you are planning to work as an effective certified air conditioning professional, then it is advisable for you to access Brainmeasures, the leading online certification company which is so popular worldwide, and take part in the air conditioning certification program that it now offers. This air conditioning course is highly recommended for you because it is guaranteed to work effectively in supplying you with the most updated and accurate information related to air conditioning. Through the availability of the company’s popular air conditioning certification program, you will get the chance to generate a more complete understanding about how air conditioning systems work, its major components, its different types and individual functions and benefits, the major processes that it uses to provide its users with the best environment and the basics of its installation. With the help of the air conditioning certificate that you will receive right after you successfully complete this online certification course, you will find it easier to impress all your potential employers with your strong background in this field. How to reject heat generated from cooling towers and condensers? The air conditioning certification program which you can now easily access at Brainmeasures caters to the needs of all individuals and professionals who want to learn more about how air conditioning systems work. This online certification program is more useful for all building maintenance personnel, building engineers, building superintendents and managers, refrigeration technicians and any other individuals and professionals who need to obtain a more complete understanding about how to operate, troubleshoot and maintain different air conditioning systems. You will not also regret completing an air conditioning certification course considering its effectiveness in letting you earn a more stable salary. With your air conditioning certification around, you will get the chance to work effectively as an air conditioning engineer which allows you to receive an average salary of $62,000 yearly. You can also use your certification to work as an air conditioning consultant which gives you the chance to earn around $62,000 to $121,000 annually.